The New Scorpion Band’s very popular themed programmes are an entertaining mix of songs and dance tunes with poetry, prose readings and folk drama. Drawing on the group members’ extensive theatrical experience, these concerts take audiences on a colourful and unpredictable journey into subjects as diverse as Britain’s supernatural tradition and the life of Lord Nelson. They are in regular demand for Arts Centres, folk, historical and maritime festivals and seasonal celebrations of many kinds. The concerts are all presented in the New Scorpion Band’s customary sartorial splendour, and the running time is about 2 x 50 minutes. 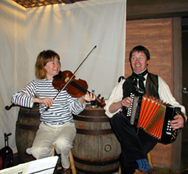 Workshops for schools are also offered, incorporating songs, dancing and social history. SOUND THE JUBILEE - music and readings from the history of slavery. This show was originally commissioned by Lancaster Cathedral to mark the bicentenary of the abolishment of the slave trade in the British Empire in 1807. 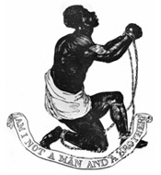 Featuring a unique collection of songs gathered from Broadside sources of the time, the programme brings vividly to life the slave trade debate of the early 19th century, and the voices of those who called so forcefully and eloquently for abolition. 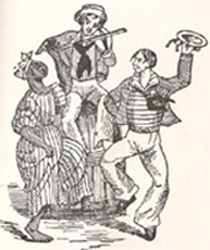 The interactions of European and African music are explored in the West Indian sea shanty and the Jamaican quadrille. 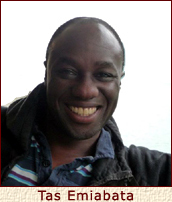 The New Scorpion Band are joined by the actor Tas Emiabata, speaking the words of Olaudah Equiano and Ottobah Cugoano, and there are readings from William Wilberforce, Hannah Moore, John Wesley, John Newton, William Cowper and others. Listen to the programme and learn more about the history and the production. The New Scorpion Band is greatly indebted to Roy Palmer for his scholarly help in the creation of this programme. 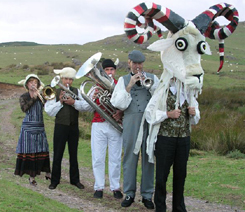 The New Scorpion Band's spookiest concert programme is devoted to the supernatural, the strange, the spine-chilling and the inexplicable, bringing together the band's usual mix of traditional songs and ballads, instrumental tunes, poems, stories and folk drama. It is an unsettling excursion into hidden and imagined worlds, as depicted through centuries of song and legend in the misty isles of Britain. Devised in 2005 for the bicentenary of the Battle of Trafalgar, the programme includes sailors’ songs, nautical dance tunes, contemporary accounts and poetry illustrating the life of the great naval hero and those who served alongside him. The story is also brought to life in traditional Dorset fashion with a Mummers' play, “King Neptune’s Defence of John Bull” .The show is in regular demand for audiences of all kinds, landlubbers included. A seasonal evocation of country life, the land and the ritual year, with songs of farming and shepherding, poaching and merrymaking, May carols and wassails, and a lively collection of jigs, hornpipes and polkas. Readings and poetry are taken from the writings of William Barnes, Thomas Hardy, John Clare and Rudyard Kipling. Star of the show is undoubtedly the enormous Derby Ram, who makes a dramatic appearance in a song dedicated to himself. The New Scorpion Band’s rousing Yuletide celebration. A glorious collection of traditional carols gives ample opportunity for the group’s fine harmony singing, and their virtuosic instrumental playing is shown off in some vigorous and joyful dance tunes. There is a visit to the Victorian Music Hall, and Old Father Christmas himself makes an appearance alongside St. George and the Turkish Knight in a traditional Mummers’ play. Poetry and prose for the season are contributed by Charles Dickens, Thomas Hardy, Kit Wright and Patrick Kavanagh. OUT ON THE OCEAN celebrates Britain’s eternal relationship with the sea, in a highly entertaining mix of sailors’ songs, maritime dance tunes, and songs of fishing, smuggling and piracy. Salty poems and readings are taken from the writings of W.S. Gilbert, S.T. Coleridge, George Grossmith and Rudyard Kipling. In 2010 the New Scorpion Band was invited by the Bournemouth Symphony Orchestra to join them in the development of a shared Christmas concert. 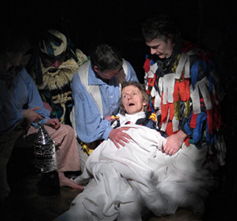 The resulting programme, WASSAIL !, premiered with great success at the Lighthouse, Poole, in December 2010, with vocal support from the Purbeck Village Quire. The concert features items from the Band, the Orchestra and both playing together, with some wintry and Yuletide poetry and another dramatic visit from the Dorset Mummers. 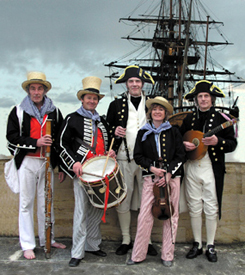 WASSAIL returned very successfully to the Lighthouse in 2011, with additional performances at the Colston Hall, Bristol and Portsmouth Guildhall.